The new power2max NGeco power meter on a Campagnolo crankset! The NGeco is the newest model in the power2max line-up. 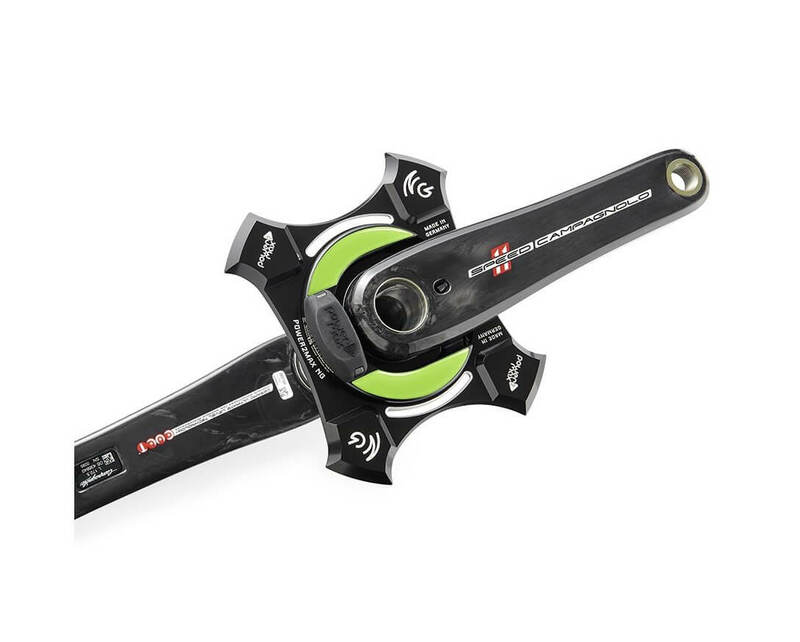 With features such as dual leg power measurement, ANT+/Bluetooth SMART compatibility and left/right power balance, the power2max NGeco Campagnolo Power Meter Crankset comes fully-loaded. In addition, the NGeco is accurate to +/- 2.0% in all environmental conditions and is easy to use with features such as auto-zero and accelerometer-based cadence measurement. The NGeco power meter measures power at the crank spider. This means it measures both left and right leg power. The power2max is always consistent and accurate, regardless of the environmental conditions. The power meter gets 300-400 hours of run time off of a single CR2450, user-replaceable battery. In addition to measuring both legs, the NGeco can also provide left/right power balance with a system upgrade. Featuring both ANT+ and Bluetooth SMART, the power meter can be used with virtually any bike computer or smart phone. With the auto-zero feature, you never have to worry about manually calibrating the unit. Just get on and go! Version: You have your choice of Campagnolo 11- or 12-speed. Please note, the Campagnolo 11-speed version can be used with a Campy 12-speed drivegtrain as long as you mount Campy 12-speed rings to the power meter. Chainrings: You have your choice of chainring sizes (or you can get the power meter without chainrings). Please note, if you select the Campagnolo 11-speed version, you will get the 11-speed chainrings. Likewise, if you select the 12-speed version, you will get the new 12-speed chainrings. Lock Ring Tool: The Lock Ring Tool for Campagnolo is required for installation. We recommend you order it unless you already own one. The power2max NGeco Campagnolo Power Meter Crankset is compatible with the 11- and 12-speed Campagnolo drivetrains. For 12-speed, please make sure you are using it with the new 12-speed chain rings. SIGN UP FOR INSTANT SAVINGS & SPECIAL OFFERS!